Founder of Mysore Photographic Society in 1945, he was also the founder of Federation of Indian Photography and was its Secretary for 40 years. He was a judge, a critic, a writer, a lecturer and had practically achieved everything creative in the field of Photography. He was the Continental Representative of FIAP and Hon. Representative of PSA in India. He was awarded Karnataka Rajyothsava Award. He passed away on 17th April 1993. A most creative photographer in India and is one of the top most in the world. He is the second in the world to be awarded MFIAP, the most prestigious distinction. He retired as a scientist from NAL. He has about 746 International Acceptances, 200 awards and Certificates of Merit to his credit. He has been awarded the Karnataka Lalitha Kala Academy Gowrava Prashasthi and Karnataka Rajyothsava Award. He was also a Continental Representative of FIAP. He began serious Bird Photography durig the early 60s. He has about 1500 acceptances in National and International Salons and has won more than 200 awards and certificates. He has judged many National and International Salons. He is the author / editor of many books on wildlife including the books "Butterflies" and "Encounters in the Forest". He is the recipient of Karnataka Lalitha Kala Academy Award. A businessman by profession, he started serious wildlife photography in 1957. He has contributed pictures to more than 1400 books and magazines, including the prestigious Life, National Geographic, etc., He received the Karnataka Rajyothsava Award in 1986, Kodak Award for Photographic Excellence in 1987, Karnataka State Environmental Award in 1993 and Karnataka State Lalitha Kala Academy Award in 1997. He is the founder member of Lionism in South India and a Melvin Jones Fellow. He served as an Engineer in Mico for 25 years and later was running "Hebbar Creations" a creative design and production unit in print media. He has served as the President of YPS for 7 years. He is a very active social worker, serving a disabled children's school. He is also a "Jyothishya Visharadha" and does counselling through astrological science. 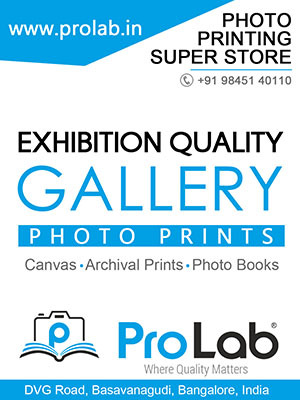 A most successful medical practitioner in Doddaballapur Taluk for more than three decades, Dr. D V Rao nourished the hobby of creative photography and literature for over 5 decades. As an accomplished writer, he has penned about 26 books including several famous novels. He has served as the President and Vice President of FIP. He is the recipient of Karnataka Lalitha Kala Academy and Sahitya Academy awards. After an enviable life of achievements, he settled down in his home town Dodderi near Ulavi. Started creative photography in 1976, he has to his credit more than 550 acceptances, 50 awards and 46 certificates in National Salons and 196 acceptances, 23 Honorable Mentions, 18 awards in International Salons. He has been a judge for FIAP distinctions continuously from 1990. He was also on the panel of jury of many National and International Salons. His printing skill in Black and White as well as in Color has helped nearly 32 photographers in achieving 48 various international distinctions. A Rank holder in cinematography, he has won countless awards in National and International Salons. He is the first Indian to get both EFIAP and MFAP in nature color prints. He has contributed pictures to various Newspapers, Calendars and Magazines. He has judged many National and International Awards. Hon-21, LM-008 T S Srinivasa Rao Sri. Srinivasa Rao took to Art of photography as a Hobby early in his life. During 1965 he was inspired by his brother and brother in law to do Bird photography. In YPS, he held the positions of Jt. Secretary and Treasurer during his tenure. His immense dedication and contributions to the holding of YPS All India and International Salons led the way to their success. He was also part of the FIP Convention organized by YPS. He had participated in many National and International Salons and won over 45 acceptances in Nature Prints, 15 acceptances in Slides and a FIP Honorable Mention. In 2001 he started a photography color lab. Md. Arfan Asif’s hidden interest towards photography grew since school days in Baldwin Boys High School in Bengaluru. He was inspired by the doyens of photography in the city in particular, Late Dr. G. Thomas, Late C. Rajagopal, Late TE D’Aguiar, Late E. Hanumantha Rao and Late B.S. Sundaram. His photographs have been exhibited in salons spread over 40 countries and won 275 plus awards in National and International photography salons and contests. To contribute towards the propagation of the art of photography in Karnataka, he instituted the Askary Awards in 1997 exclusively for recognizing youth in Karnataka. Askary Award is presented in August each year. With the recent creation of the Dubai Chapter of the Royal Photographic Society, UK, he was appointed as its Chapter Organizer. He is also the Country Representative of the Image Colleague Society International, California, USA and the Country Representative of the Photographic Society of New Jersey, USA. He runs Shutter Bugs Creative Forum in Dubai inspiring young photographers to take keen interest in photography and achieve many distinctions and awards. Hon-23 Anantha Raj Sri. Anantha Raj joined YPS in April 1973 and became the Secretary of YPS in the very next year. His concentrated efforts to strengthen YPS made a big difference and contributed to the strengthening and growth of YPS during his tenure. He was conducting two programs a month and supported by veteran photographers like, Dr. Thomas, E. Hanumantha Rao, Sri. TNA Perumal, Sri. C. Rajagopal and Sri. B.S. Sundaram. It is during his tenure, the first YPS salon was held in 1977. That was a real turning point for YPS. Membership increased. YPS became all the more popular with hosting of YPS International Salon and FIP convention. Even though he had not opted for many awards in photography, he was keenly interested in pictorial photography and made excellent images. He had great association with eminent photographers like Dr. G. Thomas and Sri. T.R. Babu, who was also his guru and mentor.